Leanne's Little Place: Lego and Dress Ups...oh to be a kid again!!!! Isn't it nice when you get to finally have a bit of a clean up in the spare room, Saturday was the day for this. The bedrooms are quite small in our house so as the kids have got bigger, some of their old favourites have migrated to the "games" room. Over time, however some of these things have been forgotten about especially when the "games" room turns into mum's scrap room, playstation area and just a good old general storage area for anything and everything! LOL. 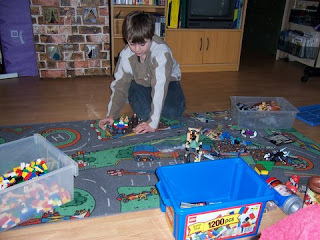 After the clean up however, the lego was rediscovered by Aaron, was so much fun, he spent a good three hours or so, just building and playing and having an absolute wow of a time, I even got into it, was lots of fun. 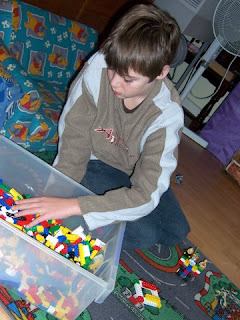 So much better than sitting in front of the computer screen or getting majorly hyped up in front of playstation, this was good old fashioned fun at a nice slow pace! 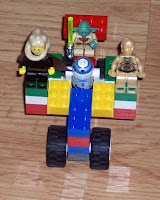 This is a sample of what he made, a little car for his Star War figurines. He also used quite the imagination and built the empire state building! I was very impressed with that, although he didn't take a photo of that, took a photo of everything else he made!! Sunday afternoon, Patty came over to drop of Josh for a sleepover. Lauren was looking for stuff to dress up as a pirate, ( the whole family has to dress up as pirates for a Birthday party they have coming up). So out came the dress up box. How much fun was that! 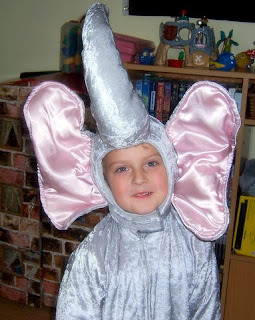 I found the elephant costume that I had made a few years ago for Aaron to dress up in for a school dress up theme - now that is love, making a costume like this just for a dress up day. I just had to get Patty's youngest, Ryan to have a go in it. How cute are these pics.....mind you he lasted about 5 minutes before he started complaining about it itching LOL, man that boy is so hard to keep still, ATTITUDE ATTITUDE ATTITUDE!! Anyway, Lauren left happy she found what she wanted to make herself look like a pretty funky pirate LOL no one else got a look in, gotta keep looking though, cause I know that I have some other stuff somewhere, hmmm may have to do some more cleaning up. I have been meaning to write for ages and say thanks so much for commenting on my blog! You and one other friend are the only ones who bother! It makes my day! 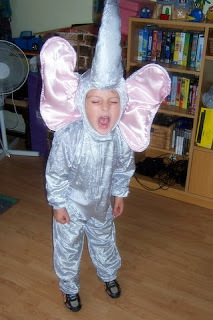 BTW, how clever are you making that elephant costume! Very impressive!